What do you do when you run out of carrots for the boatswain’s birthday cake? If you’re Great Lakes Culinary Institute student Dee Merriman, (on the right) completing your internship aboard the T/S State of Michigan, you thank your lucky stars you’re docked for the day, so someone can make a grocery run. 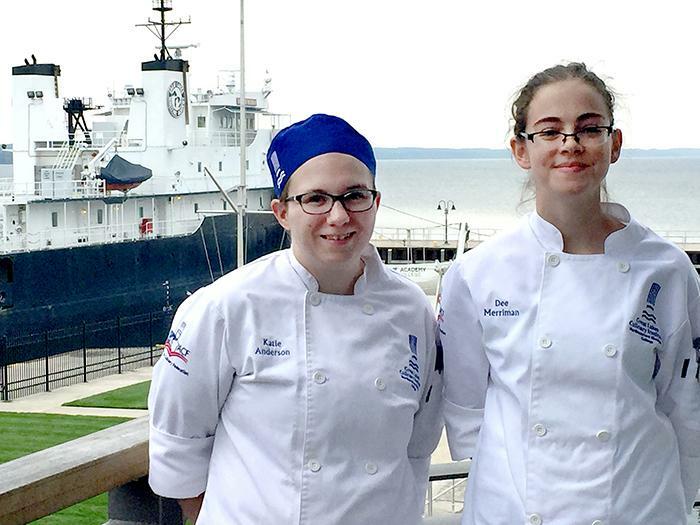 This summer, Merriman and fellow GLCI student Katie Anderson (on the left) completed their internships at sea, cooking for Great Lakes Maritime Academy cadets on their spring cruise around the Great Lakes. The innovative, interdisciplinary arrangement is already catching attention from one major shipping industry employer who’s as eager for cooks as sailors. “There are shortages of cooks for the vessels,” said Matthew Bonar, a division manager for Crowley Maritime, the third-largest shipping company in the world, which paid its regular fall recruiting visit to GLMA last week. To address that shortage, Crowley’s considered recruiting at culinary schools, Bonar said. Now, in the GLCI-State of Michigan internships, they may have found a ready-made model. 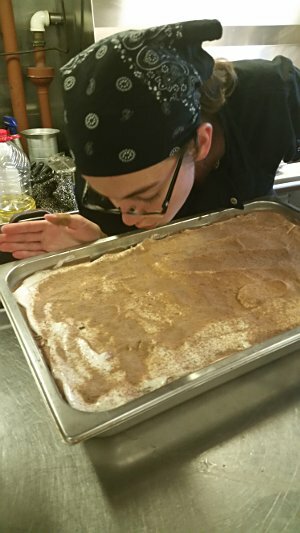 “This is a really, really, perfect segue,” Bonar said, calling the shipboard internships “trailblazing.” Jenny Terpenning, supervisor of marine recruiting at Crowley, added the company could provide scholarship money for culinary students bound for shipboard careers, too. Both Merriman, 23, and Anderson 27, found galley life appealing during their six-week summer stints on the State of Michigan. 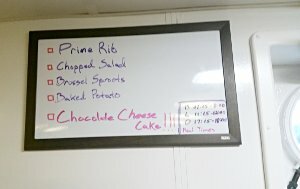 Cooking for appreciative crew members, instead of a picky head chef or customer, was a big factor, they said. Crowley’s Bonar agreed. “Food is a morale booster,” he said. Joe McGuiness, the captain of the State of Michigan, noted that exchanging a shoreside kitchen job for one at sea can mean a major increase in wages. About a half-dozen GLCI alumni currently work aboard ships, director Fred Laughlin said. In addition to their culinary training, cooks need basic safety and other maritime credentials to work aboard a ship. Those may be obtained through an employer, like Crowley, or GLMA may be able to help students as well, McGuiness said.